Illustration of the processes underlying fluorescence of calf thymus DNA. The UV-induced DNA lesions at mutational hotspots are not randomly distributed but depend on the base sequence around them. This effect could be related to the redistribution of the electronic excitation energy among the bases. During the past term, we had evidenced that ultrafast energy transfer takes place in model duplexes with repetitive base sequence; this process is possible because the initially populated states are delocalized on more than one base (excitons). It was predicted that this phenomenon should not occur in natural DNA since it is a highly disordered system. Studying the fluorescence of natural DNA, we showed that this prediction was not correct. In this case, the energy transfer process can be mediated by interconversion between ππ* states and charge transfer states. As a result ππ* excitations exhibit multiscale decay, from the femtosecond to the nanosecond time-scale. The figure shows how photon absorption populates exciton states which may be trapped by charge transfer states. Charge separation and charge recombination to ππ* states gives rise to delayed fluorescence (bold green). Minor contributions to ππ* fluorescence arise during intraband scattering and/or localization of the excitons (thin green). I. Vaya, T. Gustavsson, F.A. 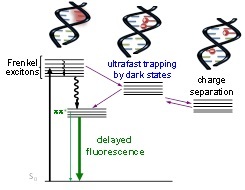 Miannay, T. Douki, D. Markovitsi: Fluorescence of Natural DNA: From the Femtosecond to the Nanosecond Time Scales, J. Am. Chem. Soc., 132: 11834. 2010. I. Vayá, T. Gustavsson, T. Douki, Y. Berlin, D. Markovitsi: Electronic Excitation Energy Transfer between Nucleobases of Natural DNA, J. Am. Chem. Soc., 134: 11366. 2012.